Goodreads Summary: For twenty-one-year-old Sydney, being in love with Kyler isn't anything new. They'd been best friends ever since he pushed her down on the playground and she made him eat a mud pie. Somewhere over the years, she fell for him and fell hard. The big problem with that? Kyler puts the 'man' in man-whore. He's never stayed with a girl longer than a few nights, and with it being their last year in college, Syd doesn't want to risk their friendship by declaring her love. Due to all the excitement surrounding FRIGID, Spencer Hill Contemporary is running a special e-book pre-order promotion. 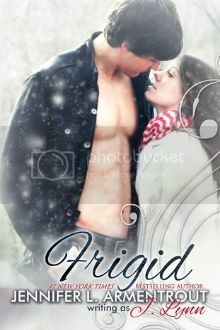 If the e-book pre-order goal is met, then FRIGID will be released two weeks early. You know you want to read the book early, so go - pre-order it! Need something to hold you over until FRIGID releases? Starting right now, you can read the first three chapters of FRIGID for free! Just read below! Can’t get enough of the hot FRIGID cover? Want to see some behind the scenes photos that are sure to make you swoon? You’re in luck! Below you can watch a slideshow of all the behind the scenes photos from the photo shoot! Go on and watch it. We’ll wait, because there is still one more great surprise! And last but not least, if you live near Philadelphia, PA, you're in for a very special treat - Jennifer will be in Philly in November signing not only FRIGID but also the last book in her immensely popular COVENANT series, SENTINEL! But that's not all. Adam, the super hot cover model from FRIGID will be there as well! So, you'll get to meet both Jennifer and Adam! Plus there will be other great prizes that you seriously won't want to miss out on (dinner with the author and model, perhaps?)! Stay tuned for more details to come! If you aren't excited for FRIGID yet, go watch the slideshow and read the chapters again! And then, go pre-order!